This video clip features an excellent live performance of the band's second hit single, which is actually my favourite track on their debut album Keep Your Distance. The deep bass is just amazing - be sure to check it out. The British Pop band's musical career was pretty short-lived as far as commercial success is concerned, and it's a shame that such a quality band couldn't have achieved more success. 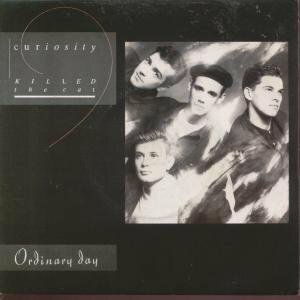 Ordinary Day was the third single release from the lads' debut album and reached #11 in the UK. Featuring a mix of soul, smooth jazz, funk and sophisti-pop, the Keep Your Distance album topped the charts in the UK during 1987. It's an 80s album that hasn't aged at all, and although the band is not quite as smooth as Sade, the music certainly has a quality that is hard to find in the charts these days. Four singles were released from the album; Misfit, Down To Earth, Ordinary Day and Free. Misfit was actually re-released again after Ordinary Day had become a hit, as the first time around it failed to chart. Vocalist, Ben Volpeliere-Pierrot, has been touring using the name Curiosity Killed The Cat since the noughties. This video clip features the band answering calls and being interviewed by Sarah Greene on the BBC kids TV Show Going Live in 1989.